I cannot, for the life of me, put this baby down when she falls asleep in my arms. I sleep with her in the same chair I begged for Addie to snuggle with me in. I waited way too long to hold a sleeping baby to go dropping her off in her crib as soon as she falls asleep just so I can get stuff done. At night when the little one is in bed I can still get the big one to climb under a blanket with me on the couch. Her feet are always freezing but she lets me huggle her too, it’s more like cozying up with a gangly Great Dane rather than a furry little kitten, but it gets the job done. These two little people, we get to keep them for as long as they’ll let us. Life just doesn’t get any better than snuggling your babies. What I would give to spend every minute with mine!!! Merry Christmas, Casey. Thanks for sharing your life with us. That photo of your two little angels is absolutely the cutest photo I have ever seen. Truth: You make REALLY cute babies. 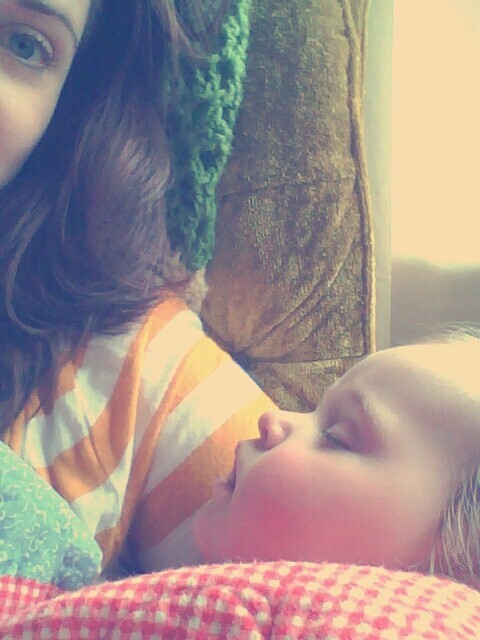 I miss holding a snuggly baby. My almost 20 month old does not like the snuggles. Sweet girls. Merry happy to you. Nor should you. If I could turn back time, I would spend more hours with a baby in my arms and less worrying about my to-do list. Well, you know what I have to say about that. I know exactly what you mean. Confession. My younger son is 19 months old, and he still takes his naps in my arms 95% of the time… I still haven’t been able to put him down yet. Merry everything to you, too! Hold her sleeping as long as you can. They grow so quickly. And that baby-weight is a special joy. I’m really glad my friend told me about your blog. I love it…I love your pictures too. Beautiful! And hold on to them….before we know it they’ll move on and away….I hate to even think about it. Eddie still cuddles me in the chair we used to fall asleep in when he was itty bitty. And last night he patted my tummy and said, “baby cha-wee in chair with mommy and eddie too.” awww! merry happy everything to you, my friend. I love, love that picture. Your girl is an angel! There is nothing better than snuggling with one of your babes, no matter how old they are. I left my husband and twins in our bedroom, playing. When I came back, all three were snuggled together in a heap on the bed, sound asleep. Such a precious time! Enjoy your babies! That first picture is breathtaking. I miss those days. 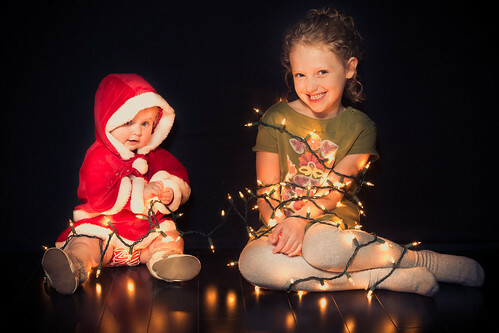 Of for goodness sake that picture of the girls is adorable. And the baby chubs ? I die!